This delicious supplement will help to improve dry, flaky skin, reduce moulting and replenish the coat's natural beauty. Simply mix the supplement with your dog's meal according to the feeding guidelines advised to be sure that your pet is getting the best out of its diet. As with adding anything new to your dog's diet, it is important to gradually introduce over a period of days to reduce the risks of upsetting your dog's digestive system. 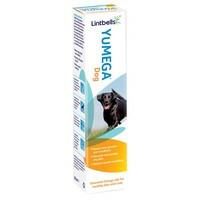 I have 2 mini dachshunds who were malting like nothing before, my youngest pup Peanut was starting to get bald patches on her neck through to her chest, and after trawling through the web I found Yumega and read nothing but great reviews. So I gave it a go (may I add that VetUK is the cheapest). I was absolutely amazed! In just 2 weeks I noticed the change, a month of adding this to their food I have seen the results. Malting has reduce by far around the 90% mark, Peanuts bald patches are disappearing. Both dogs have great coats, their so shiny, healthy & super soft! They now get tons of cuddles without covering me with hair. Its a WIN WIN situation. Just want to add that what I like about VetUK is that they are putting pets & their needs first and pretty much all of their product are at very good & affordable prices. Will continue to shop here for sure. my labrador's hair used to get every where so i thought I'd try this product, it has worked wonders hardly any hair at all now over the floor will def keep using this product.